Are you feeling crafty but short on time so close to Christmas? Needing a Christmas gift for someone special (like yourself) or just wanting a matching bag to wear to an end of year party or wedding? Here's a super easy little project that's lots of fun to source, style and produce. The end result comes up amazing and it's something all women will love. Are you hooked yet? I have been wanting to decorate my own handbags for a very long time now. I have put it off as I wasn't too sure how to go about it. I have always liked the idea of embellishing bags with fabric decals. There are so many beautiful fabrics to choose from and I don't feel skilled enough to sew from scratch. I am after more of a quick method. 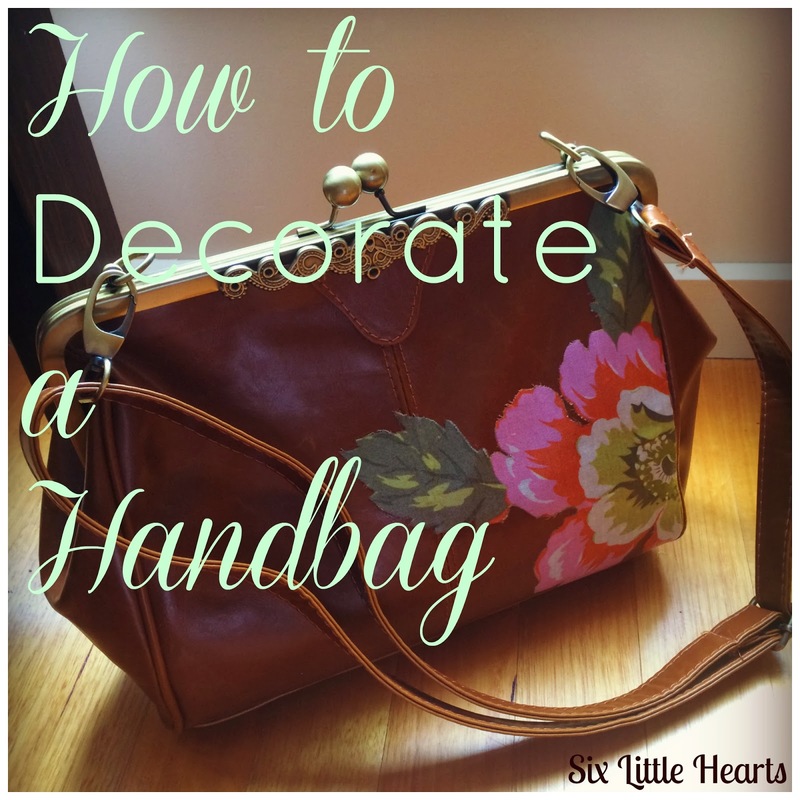 Pasting a fabric decal of my choice onto a handbag of my choosing is the way to go! This project is basically that easy - a cut and glue job. Getting it right is all about choosing the right materials. 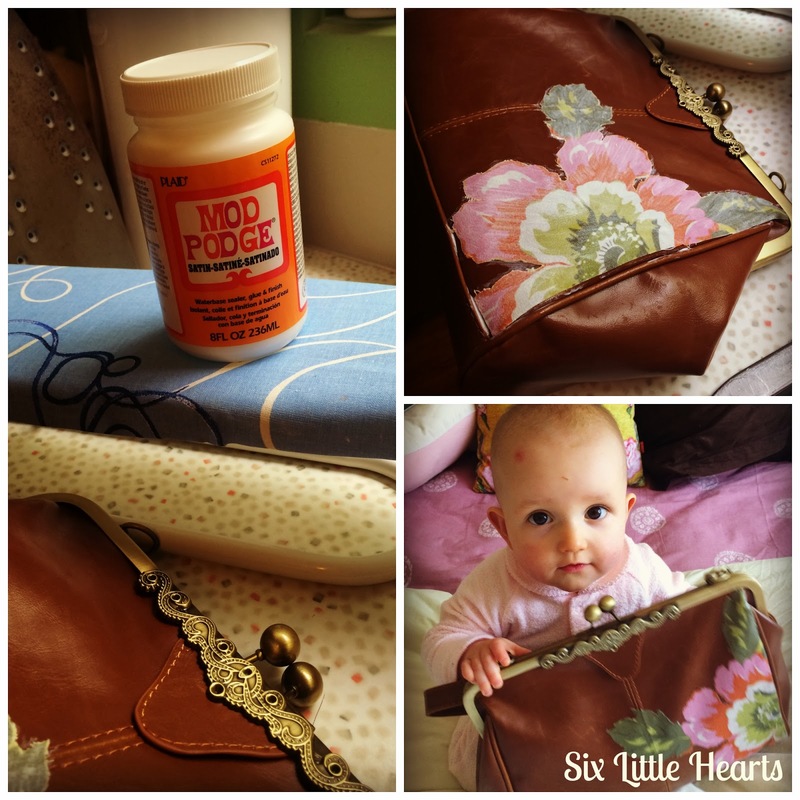 You can't use just any glue on a handbag as it needs to be a paste that is durable and able to hold for the life of the bag itself. After much research, I have found the right glue for the job. To make my bag I purchased a handbag on Ebay specifically for this craft. This one pictured is made of vinyl but you could also use a leather one if you wish. It's best to choose a bag with a lot of available surface area - nothing with studs or excessive stitching to try to attach your fabric swatch around. I purchased my fabric from an Ebay store also. You won't need much so purchase a fat quarter (quilting swatch) which should only cost a few dollars including post. This one I chose to work with is by Amy Butler from the Gypsy Caravan range and is called Citrine / Wild Poppy. Make sure you check the measurements of the decals before purchase to ensure the fabric cut-out will fit onto your chosen bag. You will need good quality sharp fabric scissors and an iron and ironing board (a sleeve board is perfect). You will need to iron out any folds or irregularities in the fabric so that it can be applied with best results. You will also need a paint brush and a plastic bag as a work surface. Finally, you will need a jar of Mod Podge Fabric glue and sealer. I purchased mine online but you can find it at all good craft stores. 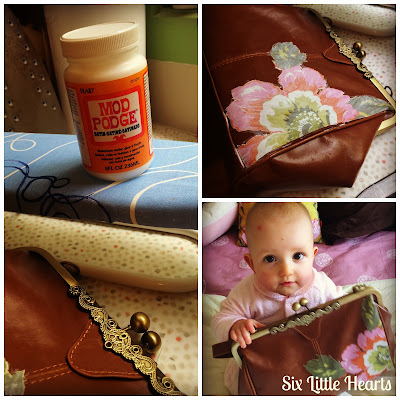 The products in the Mod Podge range are amazing! They are designed especially for the crafter and come in so many varieties for every conceivable craft. The difference between Mod Podge and PVA or varnish is that the formulation is both a glue and sealer in one. It eliminates the need to include many steps as one or two coats of your chosen Mod Podge product will do the lot. Who couldn't love a product that can do all that and boast such a cute name too! To decorate your bag simply cut out your fabric decal and decide how you will place it on your handbag. Take it slowly cutting your fabric for best results and a professional finish. Iron your chosen fabric image so that it's nice and flat. Place it upside down on your plastic bag work surface and brush a good coat of Mod Podge Fabric on the back of the fabric image - this will be the glue. Place the wet fabric decal on your bag as desired making sure you smooth out any lumps or bubbles. Do this even if there appear to be none. When you are happy with the placement, paste another good coating over the fabric image on the bag. Go over the edges a few mm as this will adhere, seal and varnish the image to the bag permanently. 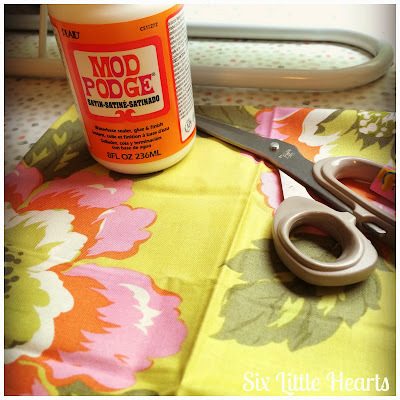 While it is still wet, use a wet soapy rag to clean up any Mod Podge smears around the image. The glue is entirely water based and dries clear but you want this part to be done neatly so that it looks professional. Allow to dry at least 20 minutes before applying another top coat and repeat the cleanup with the soapy water around the image. The end result is pretty fab I think you will agree! The image is really well adhered and able to withstand the daily rigours and strains it will encounter. I am already planning several more and eyeing off my older bags with new eyes! 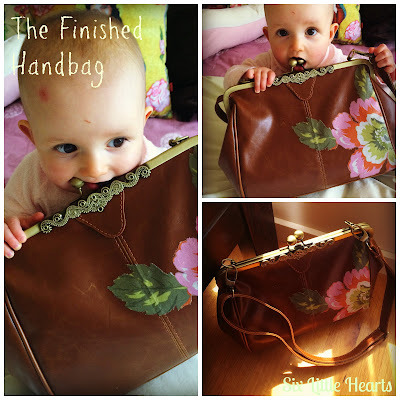 Celeste was pretty impressed with this particular bag's capacity as a teether! Not my intention when I was photographing it but it made for some cute images so here they are! Are you getting crafty this Christmas? Follow Six Little Hearts on Facebook. Link Up your Christmas themed post below. Old or new posts welcome just as long as it's Christmas craft! Visit the posts of others and share some comment love! No I've never excited about craft but I pretend I am for the kids, in fact my daughter just finished hand painting - UGH! - but she was so happy! Kid craft freaks me out too! I am a neat freak and dread the washing! Love this idea. Is there anything Mod Podge can't do??? ;) linking up with our Christmas Teacher Gifts! A Blogging Milestone - My 75th Post!